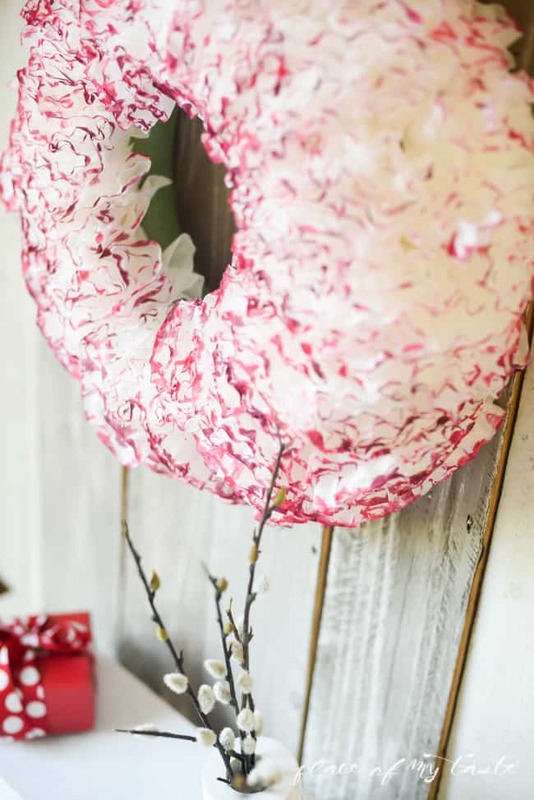 Today I am sharing how you can make this gorgeous watercolor coffee paper wreath and turn it into a lovely Valentine wreath for your front door. I mentioned here on the blog before that I can not put anything on my front door that was made with a hot glue gun as our front door gets lots of sunshine during the da. 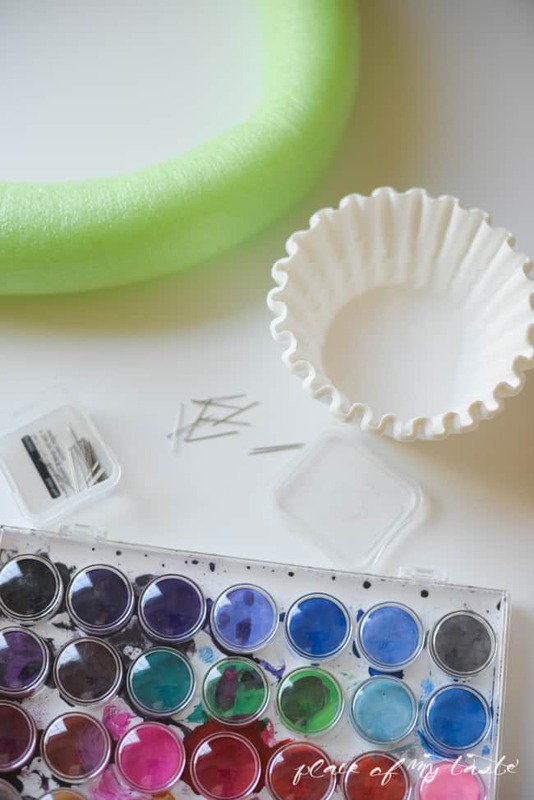 Projects that were made with hot glue would fall apart in half a day. 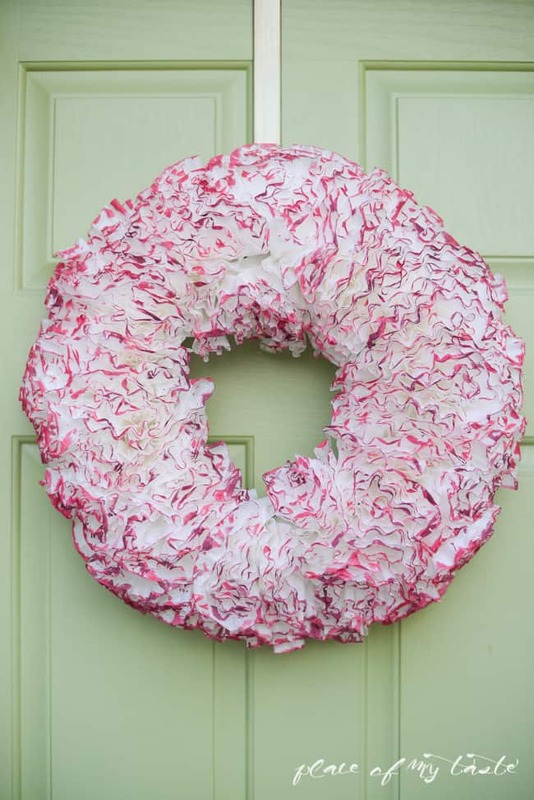 For this wreath, I used pins to secure the coffee filter to the wreath base so I can hang it on my front door. 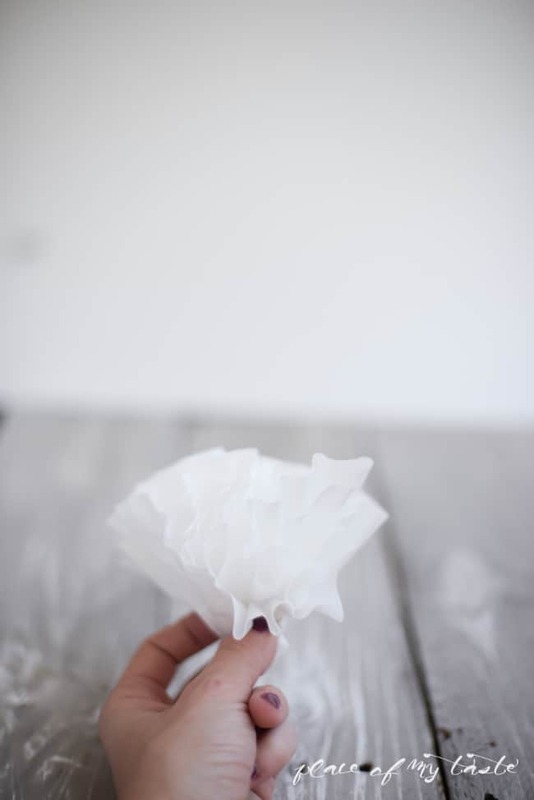 I folded the coffee filters half, then folded half again. Then I hold 2-3 folded coffee filters together, kind of like formed a little “flower” and pinned it to the wreath base with my sew pin. 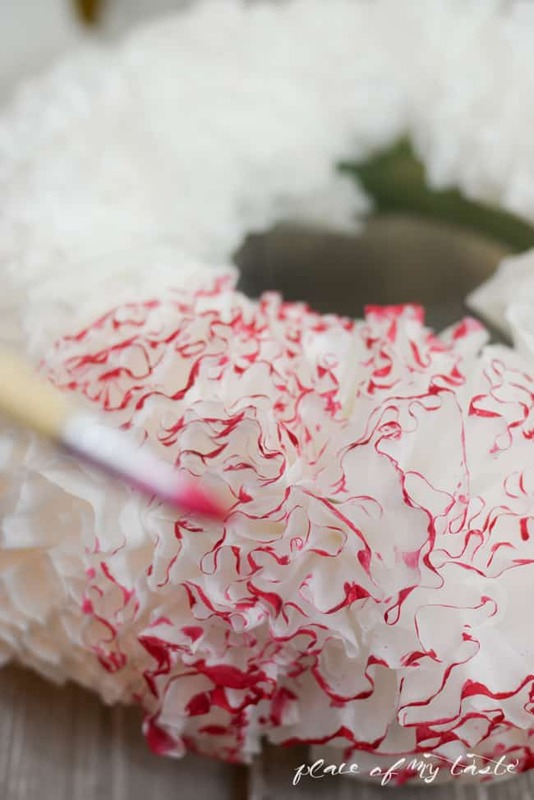 I made sure that the “flowers” were pinned on evenly, and the edges were nice and round. 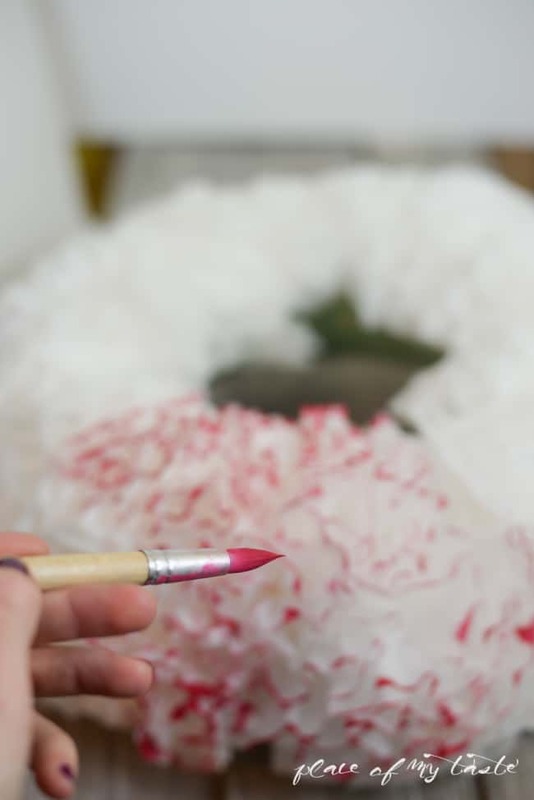 Then I painted the wreath with red watercolor. 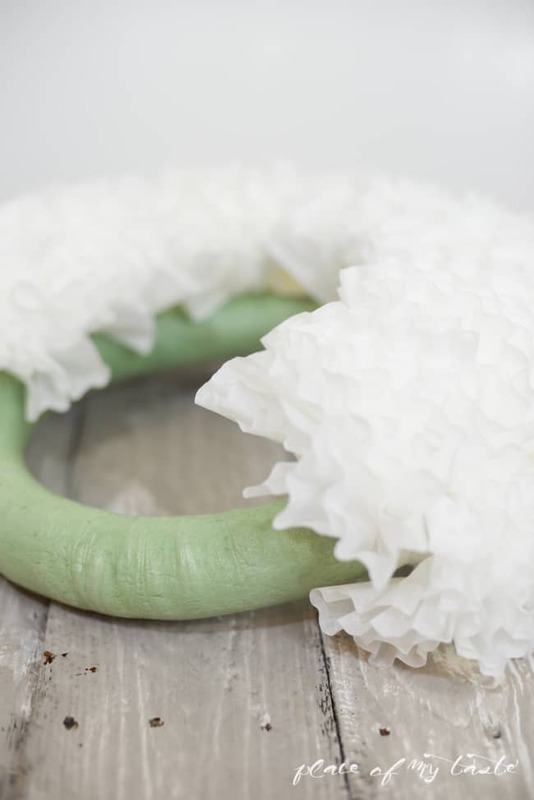 I brushed the top of the wreath slowly, almost just touching the top of the coffee filter. Once the RED color was dry, it was faded a bit and turned to this lighter, almost pinkish color. I wanted to add a little bit of extra color, and I painted another, darker coat on some spots to make this two toned look. 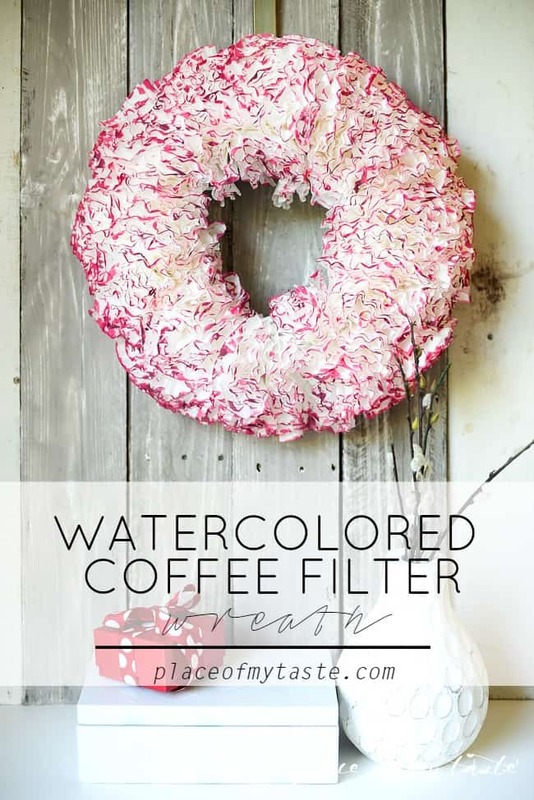 Did you like this easy Valentine’s Coffee filter wreath? 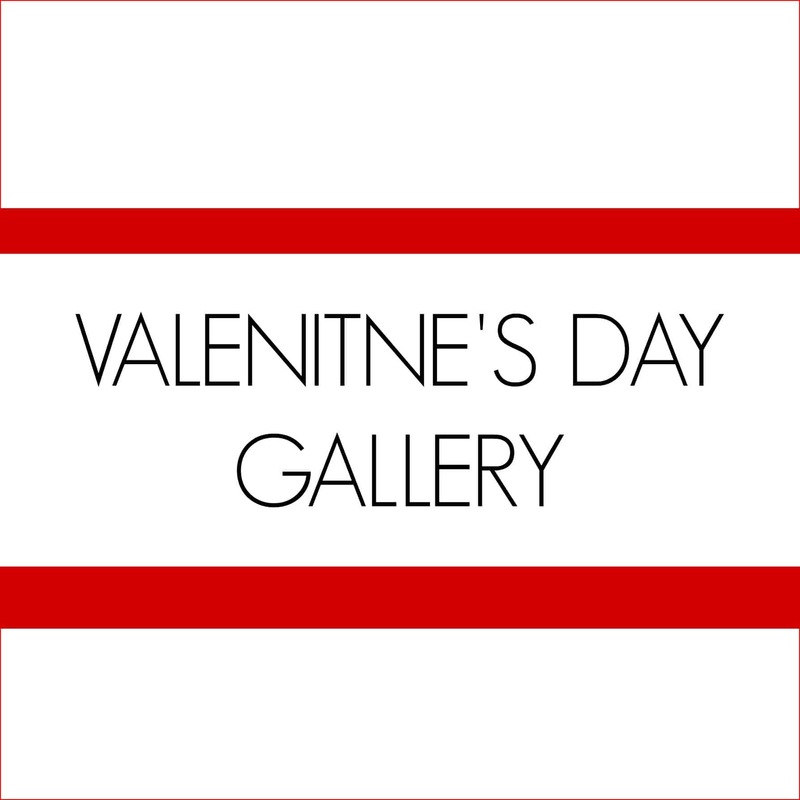 Check out my Valentine’s day gallery for more inspiration. Thank you so much:-) Have a great day! So cute! I have been meaning to make another one since I gave my last to my daughter. I’m inspired!!! Love the furniture makeover too- gotta love that satisfaction of creating it yourself & for free. AWESOME! 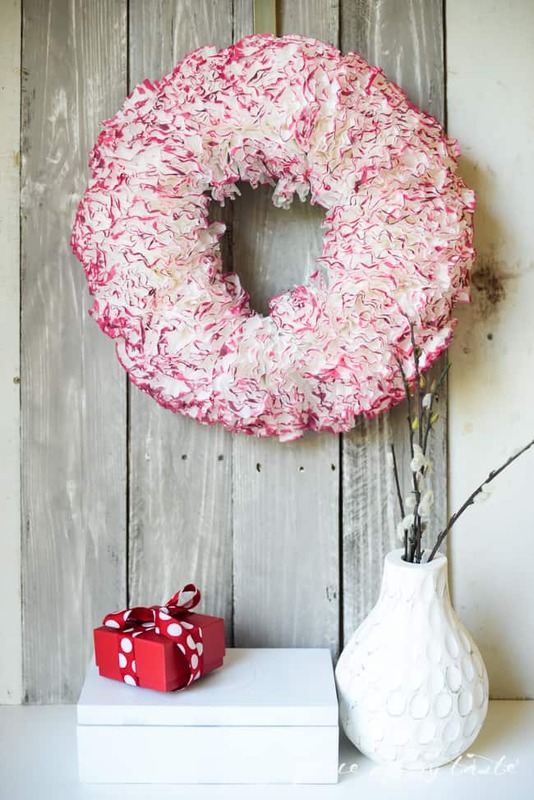 This wreath is really beautiful, it looks fun to put together too. Thank you so much Caroline-it was really easy to put together and it is truly so pretty! Have a great weekend! 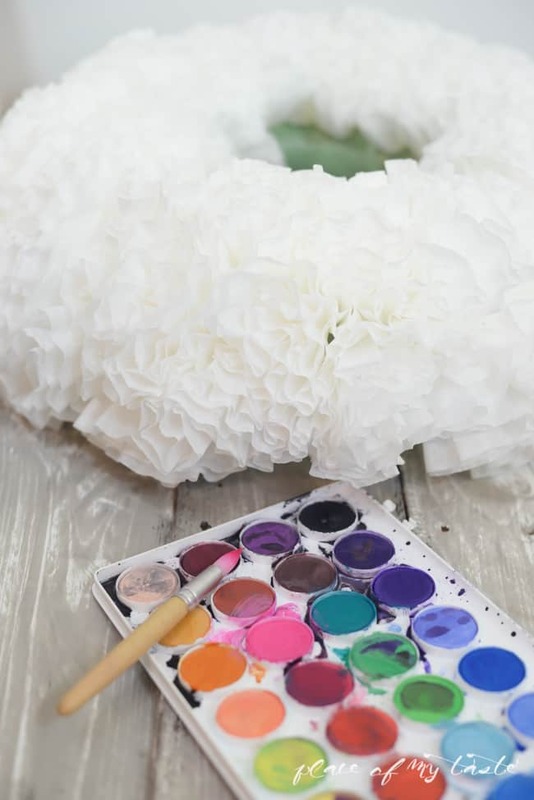 Today I found your web page and I signed up as fast as I could.Your site makes the craft projects so easy to do.Every one is made so that anyone can do them.the coffee filter wreath is beautiful, I can’t wait to go shopping. My kitchen is done in a pale blue and yellow and I think I will make one for my kitchen. Thank-you for much for your wonderful web site. You are so sweet, Tammy! Hope you will enjoy crafting decorating and cooking along! Have a wonderful day! Thank you very much for this inspiration. What I really like about this project is it can be designed for all four seasons and various holidays. So easy and inexpensive. I would use a heart shaped foam base for VDay though. I love this and can’t wait to make one or more. 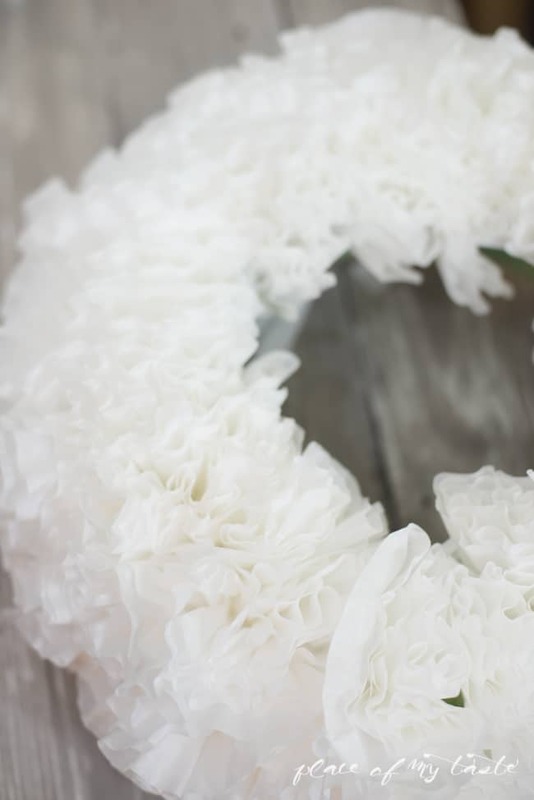 What size was the foam wreath that you used? 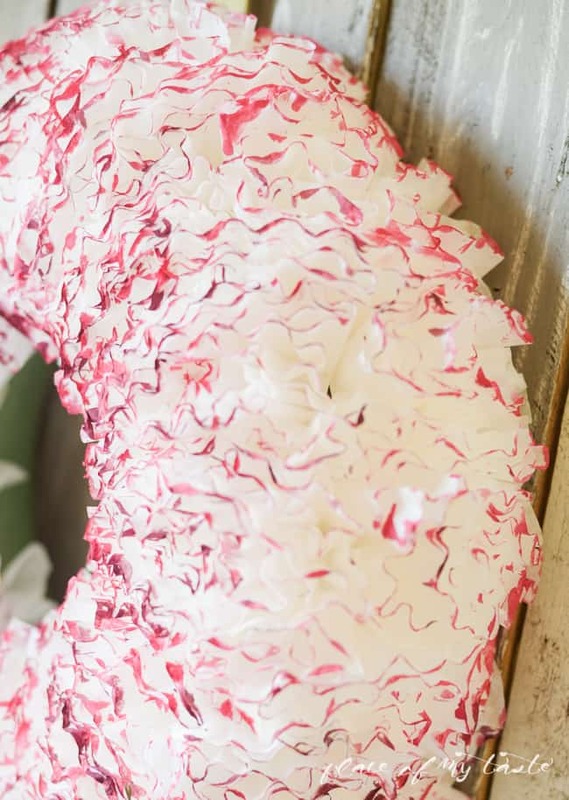 Did the rain ruin this wreath at all? I really want to make one but am afraid that the weather will completely ruin it the first time that it rains! I love this! 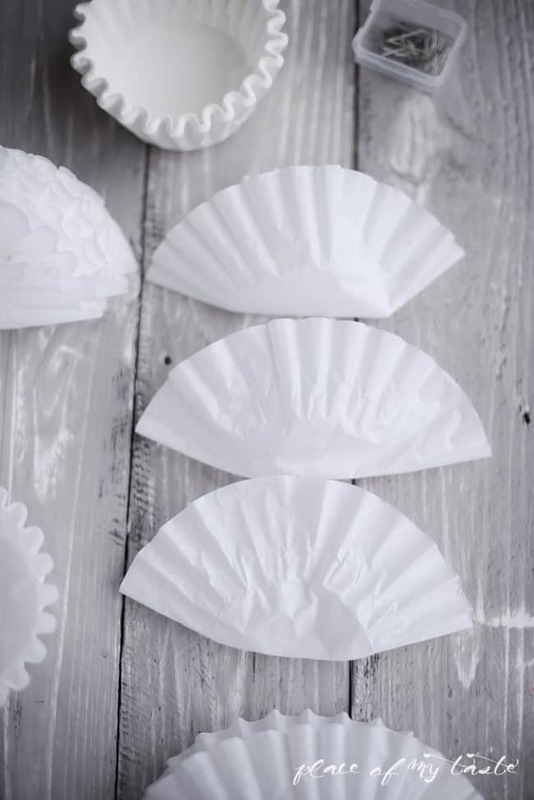 How long did it take to get all of the coffee filters on??? I’m not sure how you pinned the two or three filters on the wreath. Did you pin the side of them? Could you show a picture of that step, it would help me out alot.